One of my goals for the year is to track the botanical progression at Bristow Prairie by getting up there at least once a month, hopefully more. 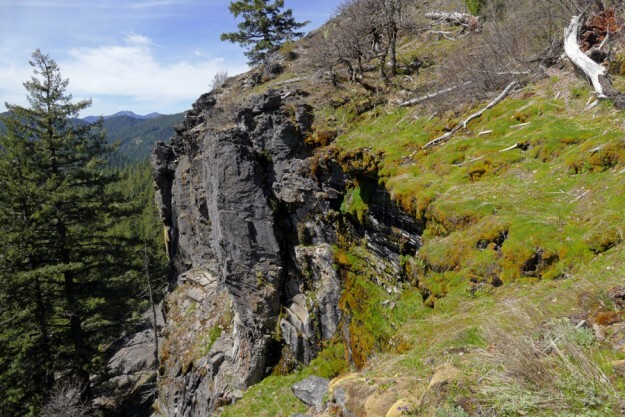 There’s such a broad variety of habitats, from cliffs to meadows to wetlands, that it should be an excellent site for observing the effects of the largely snowless winter on the different plants. So on April 27, John Koenig headed up to Bristow Prairie for my second trip of the year. While there had finally been some snow a week or so before, it was all melted again, and we only saw a few patches along the upper road and on nearby ridges. Our main destination was the lower, west-facing cliffs we first visited last fall (see First Trip to Cliffs Northwest of Bristow Prairie), so we started again at the north trailhead. Looking to the southwest, there was only a little bit of snow visible, mostly near Bulldog Rock on the other side of the valley. We were able to cut down through the woods below the trail quickly and easily to the north end of the lower cliffs. While it was still early, a number of flowers had started, including larkspurs (Delphinium menziesii), Blue-eyed Mary (both Collinsia grandiflora and C. parviflora), rustyhair saxifrage (Micranthes rufidula), and Hall’s lomatium (Lomatium hallii). There was still a good amount of moisture in numerous seepy areas, and we soon found the tiny flowers of Thompson’s mistmaiden (Romanzoffia thompsonii) whose seed capsules I had spotted on our much drier autumn visit. After our initial trip had us imagining what this neat area would look like in the spring, it was exciting to see the plants looking so fresh—we were not disappointed. As we headed south across the narrow open area, we saw more and more budded and eventually blooming mission bells (Fritillaria affinis). Most of them were hiding among the dwarfed, still leafless oaks (Quercus garryana). 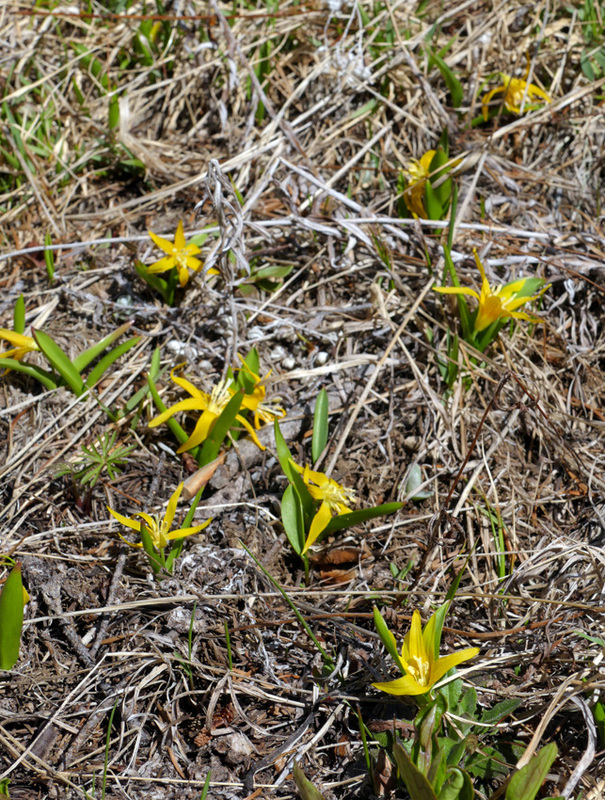 Upturned glacier lilies resting just above the soil. Starry glacier lilies were popping up in great numbers in the north meadow. 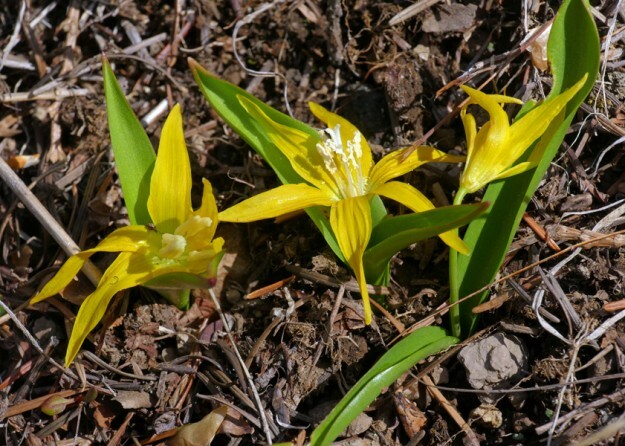 About halfway across, we spotted some bright yellow that turned out to be glacier lilies (Erythronium grandiflorum)! While they are always a beautiful sight, there was something odd about these ones. Rather than having downward-facing, reflexed flowers, these were practically lying on the ground, facing straight up, their long tepals spread out like golden stars. While there were only a few patches of glacier lilies above the cliffs, when we arrived in the first large meadow after climbing back up the slope through the forest, we were greeted by multitudes of these waterlily-like blossoms. I can’t remember ever seeing them growing like this before, certainly not en masse like this. It seems likely this is a response to the conditions being so much drier than usual when they emerged. After all, they usually come up as the snow is melting, providing them with plentiful steady moisture. Here the conditions were barely moist except in the seeps. Perhaps they were in such a hurry, they didn’t want to waste any time going through their complete cycle and “decided” to open as quickly as possible before they dried up completely. 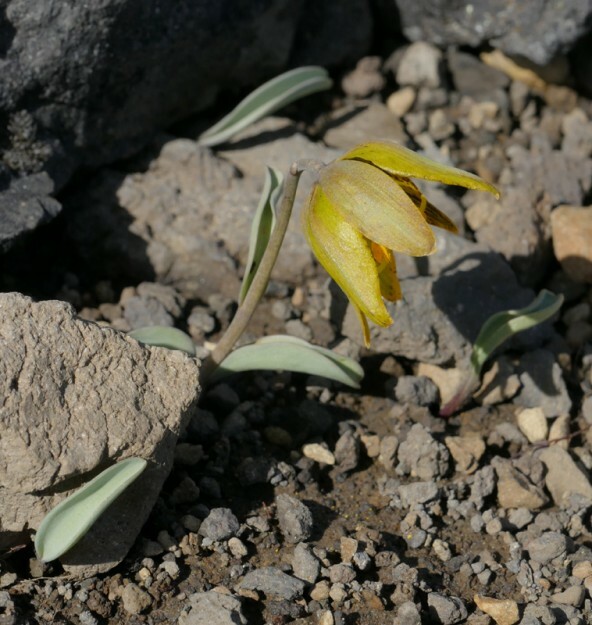 The charming flower of a Siskiyou fritillary pushes out of the rubble. Over at the rocky slope that has become my favorite destination and usual turn-around point, flowering had moved forward since my trip with Nancy a month earlier (see Super Early Look at Snowless Bristow Prairie) but not as much as you might expect after a month. Not only had there been a period of snow cover, but the nights are still cold. The larkspur (Delphinium menziesii), spreading phlox (Phlox diffusa), and Shelton’s violet (Viola sheltonii) Nancy and I had seen were still blooming, and there were also a number of barestem lomatium (Lomatium nudicaule) starting. 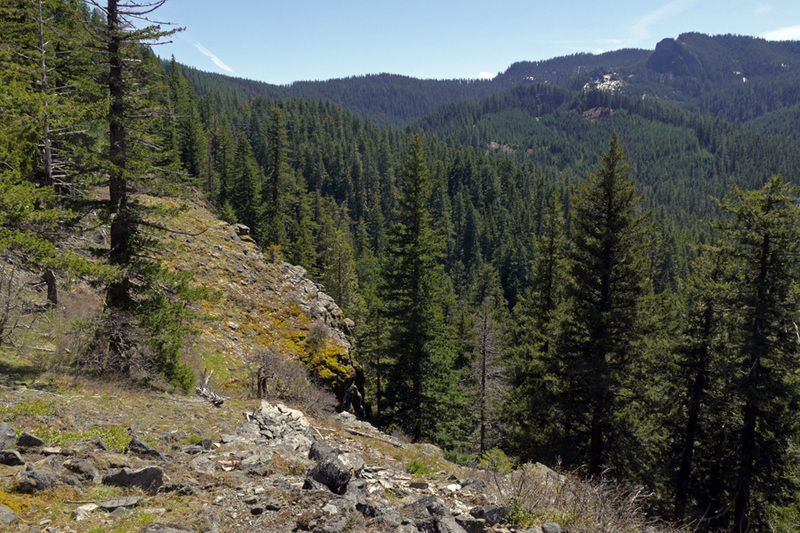 What John and I really wanted to check on was the Siskiyou fritillary (Fritillaria glauca). We found the small cairns I had made previously to mark where I had seen the budded plant. From there we walked all around trying to get a count and see if the population was more extensive than I saw in March. We were very happy to find many more leaves but especially pleased to see 3 open flowers and 6 or more buds. None of the plants had multiple flowers like they do at Heavenly Bluff, but it was still relatively more floriferous than the population at Bearbones, where I’ve only ever seen 2 flowers over at least 8 years. After returning to the John’s truck, we drove the extra mile to the main prairie to see if anything was in bloom yet. 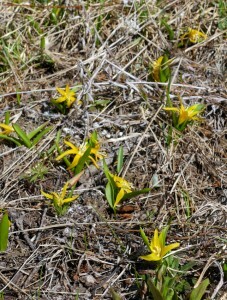 We were greeted by more of the strange starry glacier lilies. Claytonia lanceolata were still blooming but not looking any more floriferous than they had on my earlier trip. We also found another snowmelt species, steer’s head (Dicentra uniflora), that was finished blooming but still a very nice addition to my growing plant list. We had added several other less interesting species as well. The many little annuals that cover the seepy roadbank were starting to appear, including many tiny threeleaf lewisia (Lewisia triphylla), still in bud. Hopefully they won’t dry up before they’ve had a change to display their darling white flowers! I seem to see Pacific tree frogs every time I go to Bristow Prairie, even in the rocky areas. Most of the ones we saw on this trip were this bright, lime green, unlike the brown, spotted one in the photo from March. I wonder why they have so much variation in color? This little guy certainly wasn’t camouflaged out in the rocks! We were quite pleased with our day and were already talking about our next trip to Bristow Prairie on the way home as we watched the sun sinking down. When John and I get together, we always find it really hard to end our botanizing and usually get home really late. Twilight is the best time to see wildlife, however, so our day wasn’t over yet. We kept our eyes out for animals, and I was imagining seeing a bear, when dashing up the bank just uphill from Mosaic Rock, there was one in the flesh! Or more accurately, in the fur—all black and fluffy, looking really healthy. That’s my favorite animal to see along the road, so I was pretty thrilled. But wonder of wonders, just a few miles farther, we saw a gorgeous striped skunk across the road from Jim’s Oak Patch! That’s only my second in the Cascades. A little while later we saw a deer cross our path as well. 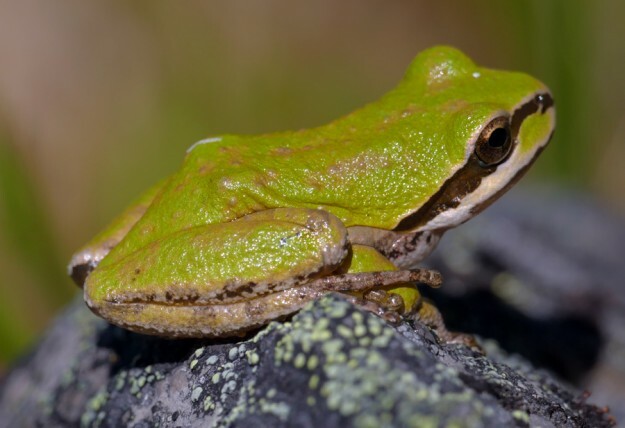 Add that to the handful of butterflies, and the 7 or 8 pretty tree frogs we saw along the trail, and we had as good a day watching wildlife as we had looking at flowers. Thanks, Tanya. Eagerly waiting to see future reports. Due to my wife’s health, and her death two years ago, haven’t done much hiking in recent years. Hope maybe to do more this year.